Any 50th Anniversary is special. 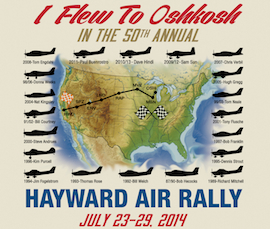 We planned something extra special for the Hayward Air Rally's 50th in 2014, a 3 day Rally all the way to Oshkosh, WI. KTVU Channel 2 aired this story about the 2014 rally (78 MB file, posted with permission). Click for the complete scoring results for 2014. So that prospective racers can get better idea of the materials provided during the briefing, a PDF copy of the 2014 Race Book is available for download here. Please note that the 2014 book is much larger than normal due to the three-day format of this special rally. 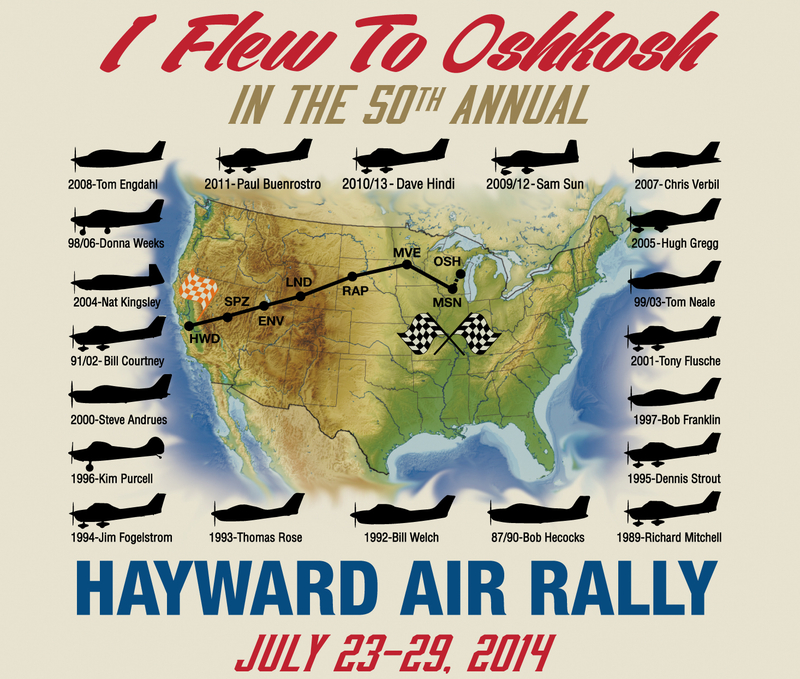 Checkpoints are to be overflown by race aircraft. Each checkpoint can be adequately identified from the air. All checkpoint and timing line overflights are recorded by a GPS data logger. The GPOS data is primary for scoring but is backed up by visual identification of checkpoints and timers at the timing lines. The 2014 course is described here to provide an example only, the 2015 course will be very different , and will not be announced until shortly before the race during the briefings. 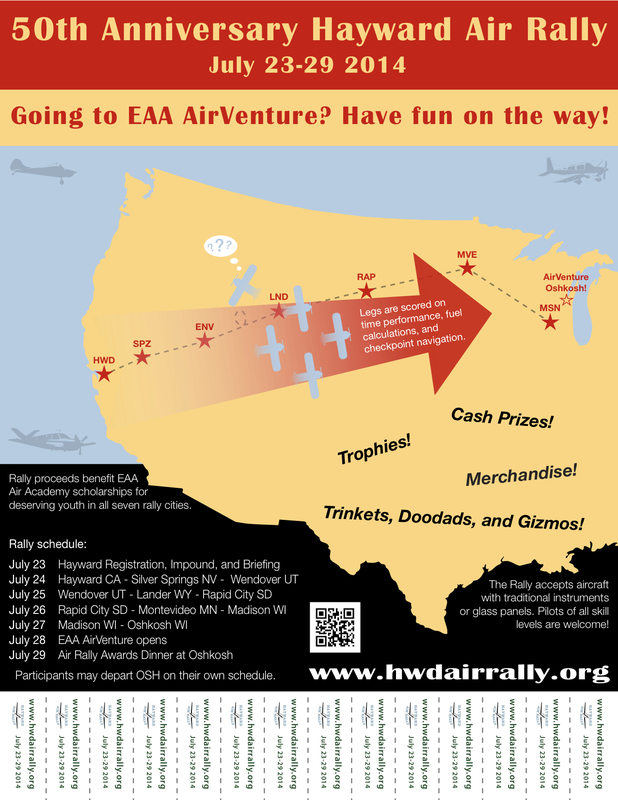 The last leg of the Rally, from Montevideo, MN (MVE) to Madison, WI (MSN) was not scored due to poor weather conditions and crew fatigue. All flight crews were instructed to proceed to Madison, WI (KMSN) on a route of their own choosing to avoid the low ceilings and weather systems. Most of the chekpoints had the traditional multiple-choice quaestions to answer. 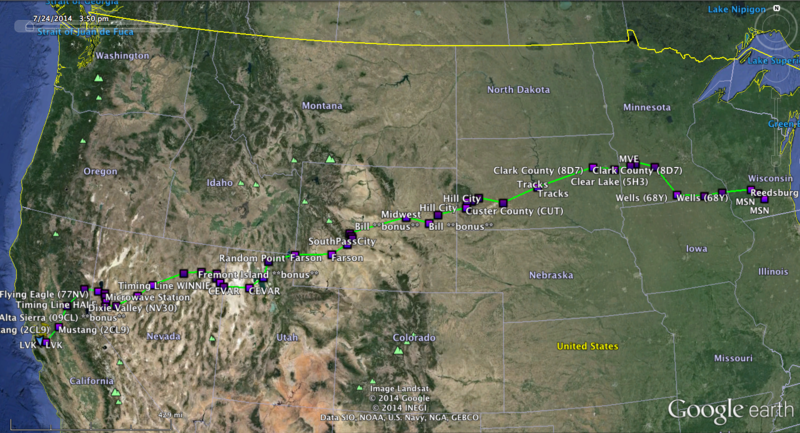 However, the primary scoring for 2014 was completed using GPS data logged in each airplane. The bonus checkpoints were scored based on the logged GPS data for time of arrival at the point vs. a predicted time (much like our timing lines) with a maximum of 20 points for zero seconds error. Roger Stenbock (formerly Race 6) sponsored a special award this year, the Stenbock CAFE Award. It recognized the most efficient airplane in the fleet - the once that used the least fuel per max gross weight for the entire rally course. This was calculated by : Aircraft Max Gross Weight / Actual Fuel Burned. Lowest (most efficient) value wins. Race 71, Tom Neale and Bob Edwards.